As the New Year approaches. . . may you go step-by-step into a gentle night and, come morning, find your heart lifted. Step by Step features paintings by Carol Aust, Oakland, California, and music by Linford Detweiler. My thanks to ArtWay for the link to the video. Wishing all of you peace and love in this New Year! Described as China's first women's rights activist, Qiu Jin (1875-1907) is the subject of the feature-length film Autumn Gem, written, directed, and co-produced (with husband Adam Tow) by Rae Chang, a San Francisco Bay Area artist and graphic designer. The film was first shown in 2009 and continues to be screened around the United States (go here for listings). Qiu Jin also was a poet; she wrote about flowers, the seasons, friendship, solitude and loneliness, women's domestic lives, marriage, heroic females, remembrance of the past. Some examples of her poetry are included in the resources cited below. The documentary is available on DVD. "The First Female Martyr for China's 1911 Revolution"
The cost of flight is landing. This week's edition of Saturday Sharing offers you an opportunity to discover your inner wine personality, learn about the 100 things you'll supposedly want to eat before you die (or before we head into the new year), test the Tate Gallery's Pocket Art Gallery app, visit National Book Critics Circle's Tumblr site, check out the latest posts at Public Domain Review, and walk a famous mile with van Gogh. ✦ Do you belong to the "Sweeties"? Are you "Hypersensitive" or just "Sensitive"? Would you call yourself "Tolerant"? Or is yours more a personality of "Many Variations"? Inquiring wine-types might want to know. Submit to myVinotype to find out what kind of wine drinker you are. Launched by "wine anti-snob" Tim Hanni and wine entrepreneur Chris Cutler, the assessment tool is designed to help you figure out your personal preferences by uncovering your "sensory sensitivities and tolerances" and "determin[ing] certain elements you value" about wine. A video explains it all. ✦ With the end of the year fast approaching, don't delay in clicking through this 2012 list of 100 Things To Eat Before You Die. Don't worry if you run out of time. A 2013 list is bound to turn up. ✦ The Tate Gallery's Pocket Art Gallery app, available at iTunes, lets you curate your own collection. ✦ The National Book Critics Circle has its own Tumblr, which always carries something of interest. ✦ The Public Domain Review, a nonprofit project that showcases out-of-copyright works available online, has featured some wonderful posts, including "The Proper Art of Writing", "Chapbooks of the Eighteenth Century", "An Alphabet of Celebrities", and "Russian Fairy Tales". This site can keep you browsing for a long time. ✦ Challenging "the idea of silence as a passive state" and how it can be explored through performance, writing, and collaboration and partnership, artist Ahmet Ogut has founded at Tate Modern The Silent University, a knowledge-exchange platform for refugees and aslyum-seekers. Ogut conceived the community project during his year-long residency at Tate, which intends to continue its support over the long term. Participants include groups of lecturers, academic consultants, and research fellows that contribute to course development and research on themes such as the refugee/asylum-seeker/migrant experience (e.g., the effects on skills and knowledge of asylum-seeker who are "silenced"). A description of the platform is here and Ogut's concept is further examined here. Additional support comes from the Delfina Foundation. ✦ What happens when you gather artists, musicians, and other creatives from around the world? You get A Big Project. The initiative, explained here, seeks to create a global shift in thinking by implementing ideas that instill hope and belief in the possibility of change and help to create a more humane society. ✦ The commission4mission, based in the United Kingdom, seeks to encourage the commissioning and placement in churches of contemporary Christian art as a way to fundraise for charities. It promotes churches' purchase of members' artworks through donations in memory of loved ones, who are commemorated (wherever possible) with plaques placed near the artworks. The organization also mounts exhibitions and sponsors and promotes art-related events. Among available member publications are Mark of the Cross, a series of images and meditations on the Passion narrative, and The Passion: Reflections and Prayer. ✦ The late artist William Mutermohlen's self-portraits, documenting over eight years his advancing Alzheimer's, are among the most moving I've ever seen. ✦ Brief video profiles of the American Craft Council's 2012 ACC Awards are here. Among the recipients are hand-blown glass artist Dante Marioni and sculptor and Gold Medal winner Stephen De Staebler. ✦ Today's video features the contemporary paintings and installations of Iceland-born, now Chicago resident Anna Joelsdottir. Images of Joelsdottir's colorful, seemingly ethereal paintings, some of which are created from mylar hand-painted with acrylic and inks and others of which incorporate such mixed media as drafting film, fabric, thread, metal, and glitter, are here. Images of the artist's site-specific installation surge at New York City's alternative arts space Clocktower Gallery are here and here. Joelsdottir recently exhibited at Chicago's Zg Gallery. ✭ "Hung Liu: Offerings" opens January 23, 2013, at Mills College Art Museum, Oakland, California. The exhibition, which runs through March 17 and precedes Oakland Museum of California's retrospective "Summoning Ghosts: The Art of Hung Liu" (March 16 - June 30), presents two large-scale, site-specific installations, Tai Cang—Great Granary (2008) and Jui Jin Sand (Old Gold Mountain) (1994), which will be complemented by related paintings and prints. The former installation is being shown for the first time in the United States. In June, San Jose Museum of Art mounts new work by Hung in the exhibit "Questions from the Sky". See the video at the end of this post in which Liu talks about her use of historic photographs. ✭ Beginning January 25, Columbia Museum of Art, Columbia, South Carolina, is showing 55 paintings, pastels, and watercolors by Impressionists, including the French masters Monet, Renoir, Pissarro, and Sisley, and Americans Mary Cassatt and John Singer Sargent. The exhibition, "Impressionism from Monet to Matisse", runs through April 21. ✭ Modern Southwestern ceramics will go on view January 26 in "Walking in the Footsteps of Our Ancestors: The Melion-Clum Collection of Modern Southwestern Pottery" at Michael C. Carlos Museum, Emory University, Atlanta, Georgia. Seed pots, red- and black ware, and basketry-inspired vessels, as well as objects made by the Quezada (Juan Quezada, Mata Ortiz) family of potters from Casas Grandes, will be on view. The show will run through January 25, 2014. The ceramics are a promised gift to the museum. ✭ An exhibition of photographs by Norwegian Simen Johan continues through February 17, 2013, at David Winton Bell Gallery, List Art Center, Brown University, Providence, Rhode Island. For "Until the Kingdom Comes", Johan has mounted a series (begun in 2006) of animal images intended to "confuse. . . the familiar and the otherworldly, the natural and the artificial, the amusing and the eerie." Johan photographed the animals in zoos and on farms, and uses Photoshop to create the particular portrait he's conceived (as many as 100 negatives may be used in creating an image). See a selection of exhibition images online. Additional images from the series may be seen on Johan's Website, organized by year (one of my favorites is Untitled #132, 2005, a photograph of two owls on a picnic bench) and at Yossi Milo Gallery (a video of the 2011 exhibition with Johan). The photographs are provocative, often fantastical, sometimes quite dark. Even if you only see them online, they invite more than a quick look. ✭ A show of Friedensreich Hundertwasser's boldly colorful work from 1949 to 1970 is on view at Kunsthalle Bremen. The exhibition, titled "Against the Grain", runs through February 17. Included in the comprehensive show of approximately 100 paintings, watercolors, and graphics are rarely seen early works, as well as masterpieces; Hundertwasser's oeuvre may be viewed here. As part of the exhibition, students from the University of Arts Bremen restaged in October the Austrian artist's 1959 "art protest" against the straight line at Hamburg Institute of Fine Arts, Line of Hamburg (also known as "Endless Line"; see the video of preparations for recreating the protest). At the time, Hundertwasser (1928-2000), a guest lecturer at the institute, was joined by his students and followers in occupying the institute and drawing a line through hallways. The protest ended after police intervened. In the video below, Poland's GlassDuo, accompanied by Sinfonia Varsovia, plays Sting's Fragile on musical glasses tuned by the Internet community. The piece results from observance of World Water Day on March 22, 2012. The music is beautifully performed on the glass harp. Enjoy it on this cold December day! Ease into the day with Playa, artist and musician Ruben Dhers's sound installation. According to Dhers's Website, the piece comprises 14 steel-string acoustic guitars, fabric, motors, and a computer. My thanks to Atlantic for the link. Wishing all of my readers and friends the beauty of the season. Merry Christmas, everyone! 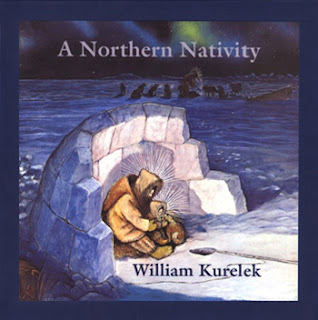 In his 1976 children's book A Northern Nativity*, renowned Canadian painter, illustrator, and writer William Kurelek (1927-1977), whose exceptional artwork is found in the Museum of Modern Art (New York City), Hirshhorn Museum (Washington, D.C.), Gallery of Canada, and numerous other museums in North America and Europe, reconceived the story of Christ's birth in the northern snows of Canada. Below is a lovely video in which Kurelek's beautiful Nativity images have been set to When Winter Comes, a primarily instrumental composition by Chris de Burgh. clouds to field a star of wonder. Three shadows reel toward Bethlehem. is negligible compared to what he imagined and intended. . . .
~ Adam Kirsch, "Rocket and Lightship"
Adam Kirsch, Senior Editor, The New Republic, Columnist, Tablet; Author, Why Trilling Matters (Yale University Press, 2011), Invasions: New Poems (Ivan R. Dee, 2008), The Thousand Wells: Poems (Ivan R. Dee, 2002), and Benjamin Disraeli (Nextbook Press, 2008). Kirsch has also written several nonfiction books about poetry: The Modern Element: Essays on Contemporary Poetry (W.W. Norton, 2008) and The Wounded Surgeon: Confession and Transformation in Six American Poets (W.W. Norton, 2005). This week's edition of Saturday Sharing highlights LabLit, novelist Mark Siegel and his wonderful site Sailor Twain, the blogs Ephemeral New York and The Bowery Boys, Victoriana and Victorian Rituals, and the American history site Clio. The feature video is about the effects of color. 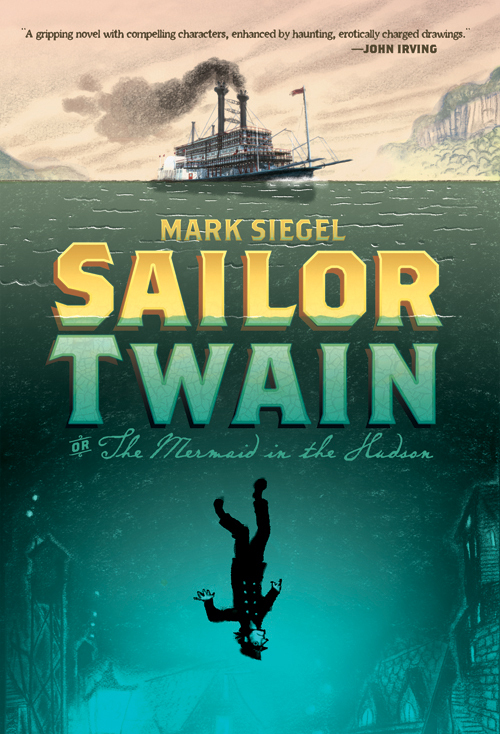 ✦ Web extras for graphic novelist Mark Siegel's Sailor Twain or the Mermaid in the Hudson include an impressive rain playlist featuring Jacques Brel, Eurythmics, Guns and Roses, Ray Charles, and many other composers and musicians. New York-based Siegel is the force behind Macmillan Publishers imprint First Second Books, dedicated to graphic novels. Be sure to visit the site. ✦ The Big Apple is ever-changing, and Ephemeral New York blog aims to chronicle it all. Some wonderful historical information about New York City can be found here, and also at the fascinating blog The Bowery Boys. ✦ If you have a special interest in all things Victorian, check out Victoriana, where you can indulge yourself in information about historic Victorian houses and restoration, gardening, decorating, recipes and menus, fashions, and parties and fun, among other subjects. There's even a fun article titled "Dating in the Victorian Age". Also of interest is a separate site, Victorian Rituals, which addresses, among other fun stuff, Tea Thyme Rituals and Popular Victorian Rituals (etiquette, calling cards, language of flowers, letter writing). ✦ At Clio, American history is explored in images and words. In addition to one-of-a-kind online photography exhibits, the site features a virtual exhibition titled "Illustrated Histories and the American Imagination, 1840-1900" that uses interactive graphics and another titled "Lowell Thomas and Lawrence of Arabia: Making a Legend, Creating History". ✦ Need a last-minute gift that's art-related? 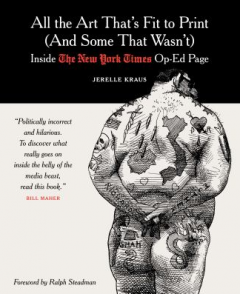 Pick up a copy of Jerelle Kraus's All the Art That's Fit to Print (And Some That Wasn't), a collection of op-ed art printed in The New York Times between 1970 and 2008. This review takes a peek inside the 280-page book published by Columbia University Press. ✦ In a series of Art Talks, Vassar College professors, student docents, and curators and educators offer interpretations of works at the college's Frances Lehman Loeb Art Center, Poughkeepsie, New York. ✦ You'll find a number of brief and interesting videos in the "Meet the Artists" program with art critic Adrian Searle. ✦ Below is a 3:35-minute excerpt from The Toxic Camera, a film commissioned for the 25th anniversary of the Chernobyl disaster and shown for the first time last month at Whitworth Art Gallery at the University of Manchester, United Kingdom. The film was made by British video artists Jane and Louise Wilson, who were inspired by Vladimir Shevchenko's film Chernobyl: A Chronicle of Difficult Weeks. (Shevchenko's on-site filming resulted in his death.) The gallery's exhibition of the Wilsons' recent works is on view through January 27, 2013. ✦ The site Facing History and Ourselves, devoted to eliminating racism, antisemitism, and prejudice through educational programs worldwide, is offering an online exhibition "Illuminations: The Art of Samuel Bak", featuring images of 20 original works by the internationally renowned artist (b. 1933) and Holocaust survivor. Analysis and interpretation are provided in audio, and the online show is accompanied by resources for educators to facilitate discussion of the extraordinary artwork. At Facing History's Brookline, Massachusetts, headquarters, the paintings have been placed on view. Bak, who enjoyed his first exhibition at age nine, resides in Boston. He published his memoir Painted in Words (Indiana University Press) in 2001 and is the subject of several documentaries, one of which is below and well worth your time. Bak was awarded the German Herkomer Cultural Prize in 2002. He is represented by Boston's Pucker Gallery. Samuel Bak: The Art of Speaking About the Unspeakable from Facing History and Ourselves on Vimeo. A second documentary, Samuel Bak: Painter of Questions, is available through The National Center for Jewish Film. 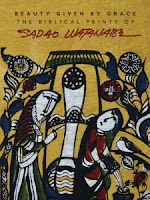 ✭ In Wheaton, Illinois, the Billy Graham Center Museum at Wheaton College is showing through March 24, 2013, "Beauty Given by Grace: The Biblical Prints of Sadao Watanabe". The exhibition features 50 original momigami (wrinkled paper) and washi (plain mulberry paper) prints, cards, and calendars from private collections. 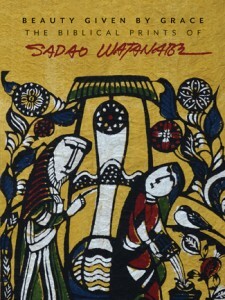 Watanabe (1913-1996), who enjoyed an international reputation, was a master of the traditional folk art of hand-cut stencil dyeing, katazome. He considered it his mission "to create Christian art for the Japanese people." The book Beauty Given by Grace (Square Halo Books, October 2012), available through the Christians in the Visual Arts store, features essays by Sandra Bowden, John A. Kohan (an excellent essay by Kohan about the life and art of Watanabe appears in Image Journal, No. 74), and Makoto Fujimura. A selection of images from the exhibition is here and here (scroll to bottom of screen). Note: The exhibition is available to other galleries and museums through CIVA's exhibition coordinator (exhibits@civa.org/); information is here. ✭ Running through February 24 at Corcoran Gallery, Washington, D.C., is "Taryn Simon: A Living Man Declared Dead and Other Chapters I-XVIII". Produced between 2008 and 2011, A Living Man Declared Dead, according to the photographer, aims to show how "the external forces of territory, governance, power, and religion collid[e] with the internal forces of psychological and physical inheritance." For her project, Simon, the Arnold Newman Distinguished Visiting Lecturer in Photography, traveled around the world to research and record bloodlines and their related stories; she documented, among others, victims of genocide in Bosnia, feuding families in Brazil, and the "living dead" in India. You'll find other videos with Simon, a number of which are interviews, here. A selection of articles and essays about Simon's work is here. Four of Simon's photographic projects, including A Living Man Declared Dead, have been published as books. ✭ The Museum of London has mounted a fascinating exhibition that is on view through April 14: "Doctors, Dissection and Resurrection Men". The show, featuring not only anatomical models and drawings but also original artifacts and human and animal remains, follows on a 2006 discovery of a burial ground at Royal London Hospital, Whitechapel, excavation of which produced evidence of autopsies, amputations, bones wired for teaching, and dissections of animals for instruction in comparative anatomy. The video below, "The Ballad of the London Burkers" ("burkers" were body snatchers), featured in the exhibition, offers a sneak peek; see other videos at the YouTube link below. Tickets are required for entry. to just have a place just for the sake of creating beauty. I first wrote about China-born Lily Yeh, founder of Barefoot Artists, a Philadelphia-based nonprofit that uses art to transform impoverished communities, in November 2009 (read the post). Recently, I learned that the documentary about Lily Yeh, The Barefoot Artist, has completed filming and is now in post-production and seeking support to bring out the film. Below is a preview of the documentary, which develops a complete portrait of how Lily Yeh evolved as an artist and as a citizen of the world, building community by using art as its foundation. Not only a marvelous artist, Lily Yeh is an extraordinary human being whose work has touched, and continues to touch, many, many lives. Although Lily Yeh lives in Philadelphia, Pennsylvania, her real home is wherever need for social change is born. and recreate that dustless place. . . . The Barefoot Artist, trailer from The Barefoot Artist on Vimeo. The film's directors are Glenn Holsten and Daniel Traub. You will find additional resources about Lily Yeh in my original post mentioned above. your chance to get out. from that side of the street to yours. This poem is inspired by photographs of and recent reporting on the horrendous ongoing civil war in Syria and, in particular, in Aleppo. Of special note are the images by Narciso Contreras (caution: the photographs are graphic) who has documented with courage and at great risk to himself the truth of this war. for the single promised star. more must close around us. our journey so long, unrevealing. 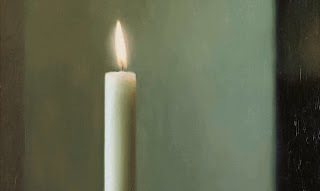 of candle at uncurtained windows. four elements purposed, each one one more becoming. is just to see the world through its eyes. In this wonderful animation from TEDEd, poet Jane Hirshfield explains what metaphors are, what makes good metaphors, and how our use of metaphors, especially in poetry, helps us better understand our world. For more TEDEd videos, go here. Christian Wiman, from "Gone for the Day, She Is the Day"
Today's new edition of Saturday Sharing shows you a somewhat nutty museum, 3D versions of Marie-Antoinette's roomy Palace of Versailles, a city-by-city poem atlas, the location for knitting and purling poems, and a place for listening to 1950s audio recordings by poets. The featured video is a touching documentary about a photographer's project to document the lives of elderly animals. ✦ I last visited the Palace of Versailles in the 1980s. Now I can see it anytime via Versailles 3D from the Google Cultural Institute. The site provides a history of the palace's construction using four scale models built in 3D and offers educational videos and other interactive features to make virtual visiting memorable. A list of other wonderful online projects at the Cultural Institute is here. ✦ Can you imagine knitting a poem? Go here, type in some words, and your poem willl be knitted and purled for you. ✦ Some people go bananas; others have a thing for nuts. . . of all kinds. One was Elizabeth Tashjian a.k.a. "The Nut Lady", who founded the Nut Museum in Old Lyme, Connecticut. The museum's Website offeres vintage sound recordings of Tashjian singing her own songs, including "Nuts Are Beautiful" (and a distinctive voice it is! ); it also features a tour of the Nut Galleria comprising artwork and quotes from the lady herself. My favorite quote? "Take nuts home." ✦ Search this atlas by city to find poems that have appeared in the Poetry Society of America's Poetry in Motion® project. ✦ A project of The Poetry Center at San Francisco State University, the Poetry Center Digital Archive provides access to early audio recordings (mid-1950s on) from the American Poetry Archives collection, select archival texts, and images. The PCDA, comprising one of the most significant public collections in the United States of original recorded performances by poems and other writers, is augmented frequently. Elderly Animals: Photographs by Isa Leshko from Mark & Angela Walley on Vimeo. ✦ With a background in scientific and medical illustration, 3-D artist Bryan Christie shows us in his elegant and even haunting mixed media, digital prints, video, and sculpture what can happen when art uses science to explore the body and reveal its wonder. I was especially taken with Christie's Hand 1 (2011). See his portfolio for additional award-winning work, encompassing human anatomy, biology, medical explanations, architecture, maps, technology, animals, and more. Christie's animations are marvelous. ✦ New York City's Metropolitan Museum of Art has launched MetPublications, a portal to the museum's publishing program. Beginning with 650 titles from 1964 to today, the resource will continue to expand. Plans are to provide access to almost all of the Met's books, bulletins, and journals, including online publications. Typical information includes a description, table of contents, author information, awards, reviews, and links to related content by author, theme, and keyword. Searching also is possible by publication type and collection. Available in-print work carries a link for purchasing. Contents of many titles may be read online, searched, or downloaded as pdfs. ✦ From New York City architecture to glacial landscapes in Norway, Iceland, Alaska, New Zealand, and Patagonia, photographer Caleb Cain Marcus creates images of astonishing beauty. In numerous museum collections, his work achieves a painterly quality, drawing the eye again and again into discovery. 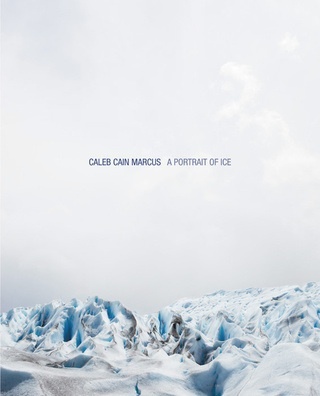 Take time for his marvelous photographs of glaciers, A Portrait of Ice (available at Amazon; see image at left), and his project America, featuring images from Louisiana, Virginia, Arizona, and Utah during the four seasons. ✦ The Reed College Digital Collections comprises more than 80,000 images and other digital materials, include artworks, photographs, maps, and primary source documents. I especially enjoyed browsing the collection of Artists' Books, which include traditional letterpress-printed poetry collections, conceptual book works, sculptural and visual works, concrete poetry, and magazine work. Recent additions include the Kiki Smith and Leslie Scalapino collaboration The Animal is in the World like Water in Water, Anna Akhmatova: Poems with art by Oleg Gergatchov, and An Introduction to Square Word Calligraphy edited by Xu Bing. The section may be browsed by artists, books, and genre, as well as word(s) and title. Both Gallery View and Slideshow View are available. ✦ For anyone who missed the MoMA's 2003-2004 exhibition "Kiki Smith: Prints, Books, and Things", do the next best thing: go online to see the interactive Website, which presents more than 200 images, in addition to music and video. Work may be explored by theme, process, and image. It's a wonderful introductory resource about the internationally known sculptor and printmaker. ✭ In Washington, D.C., "Poetic Likeness: Modern American Poets" is on view at the National Portrait Gallery through April 28, 2013. The exhibition includes portraits of poets Walt Whitman, John Ashbery, Marianne Moore, Elizabeth Bishop, Sylvia Plath, Ezra Pound, Hilda Doolittle, and many others by such photographers as Man Ray, Berenice Abbott, Hans Namuth, and George Plath Lynes, all aiming a keen eye to "putting a face to the distinctive voices of American poetry." Before you go, take time for the exhibition's informative Web pages: Prologue, Make It New, The Beauty of Inflections, Asking Compassion, and The Spoken Word, where you'll find images, biographical information, cultural context, artists' drawings and paintings of poets, interesting quotations, and audio recordings. ✭ Organized by London's Victoria and Albert Museum, Peabody Essex Museum's "Hats: An Anthology by Stephen Jones" displays plumed bonnets, silk turbans, sequined caps, "fascinators", pop cultural headgear, and many other styles created by such designers as Balenciaga, Givenchy, and Schiaparelli, and curated by the British milliner. The exhibition (highlights in PEM's press release) is arranged thematically: sources of inspiration, creation (techniques, materials, processes), buying and selling, and wearing and etiquette. (A full description and installation views online accompanied the show while it was at Bard Graduate Center earlier this year. The London museum maintains a microsite online.) The exhibition at the Salem, Massachusetts, museum is on view through February 3. 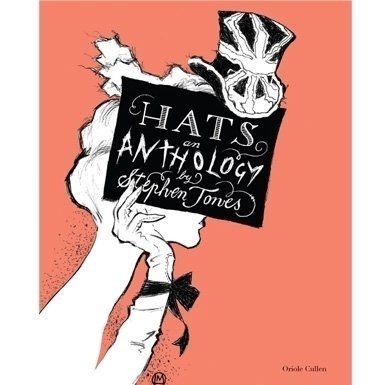 According to Jones's Website, it is joined by displays of Boston milliners and a cabinet of American hats from PEM's collections (included is Boston Red Sox David Ortiz's baseball cap). ✭ San Francisco Museum of Art is presenting through February 3 a retrospective of the work of Jay DeFeo (1929-1989), part of a community of Bay Area artists, poets, and musicians who came to prominence in the 1950s. The exhibition includes nearly 130 collages, drawings, paintings, photographs, small sculptures, and jewelry spanning four decades of art-making. DeFeo's approach to materials was unconventional, her physical process described as "intensive". Her extraordinary work The Rose is the subject of a book, Jay DeFeo and The Rose, edited by Jane Green and Leah Levy (University of California Press and Whitney Museum, 2003); it resides at the Whitney. A number of interactive features, videos, and audio recordings relating to the exhibition can be found here. 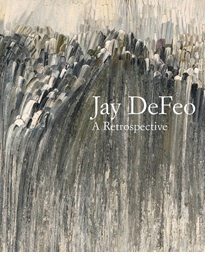 The Jay DeFeo Trust features comprehensive information about the artist and her work. A 320-page catalogue of the exhibition (available as of November) includes essays 300 color and 30 black-and-white illustrations. The exhibition travels to the Whitney Museum of American Art, New York City, in February. ✭ The Japan Society, New York City, is featuring "Silver Wind: The Arts of Sakai Hoitsu (1761-1828)" through January 6. Work by the Samurai-aristocrat-turned-Buddhist-monk includes 58 screens, scrolls, painted fans, lacquer wares, and woodblock-printed books. Of special note is Maples and Cherry Trees, a pair of screens lined with gold leaf and painted in previous mineral pigments; the screens replaced Waves, a pair of 12-foot-wide six-panel screens sheathed in silver leaf and brushed in black ink, that were so fragile they could only be displayed until November 4. An admission fee is required to see the exhibition. A catalogue accompanies the show. the shove to the tracks. 2012. December 3. 49th Street. the instant you see already too late. This poem is inspired Clyde Haberman's City Room post "Not Silenced, 33 Years After Her Own Subway Nightmare", The New York Times, December 10, 2012. Sir Henry Tate (1819-1899), inventor of the sugar cube, made his fortune in — what else? — the sugar trade. The magnate had a penchant for art, assembling a significant collection that he bequeathed to the United Kingdom. He also donated funds to build the first Tate Gallery (there are now four Tate museums). As a tribute to Sir Henry, Belfast-born artist Brendan Jamison carved a sculpture of the Tate Mausoleum, using some 27,000 cubes of sugar. Below is a short video that gives an idea of the artwork, which was created at the invitation of Jane Millar, curator of Curious Art Trail at the fascinating West Norwood Cemetery, London, where Sir Henry Tate's Mausoleum was installed this past summer. Jamison, who also works in wool and wax as well as wood and bronze, also sculpted Tate Modern for the London Festival of Architecture (2010) and reproduced 10 Downing Street, as seen in the video below. The former required 71,908 sugar cubes and the latter, 5,117 sugar cubes; both are to scale. Other Jamison sugar cube marvels are shown here. to stop a ten-foot wave. the water, always comes, pulling. It tugs, taking sons from her. spellbound a room on Capitol Hill. what a mother could not not let go. meant water didn't take it. Today, a single white coffin contains. reaching, even now, for higher ground. The Night Before Christmas probably is too late to be e-mailing but in our Little Town of Bethlehem, We Three Kings of Orient Are the only postal service open late, and they refuse to guarantee even this Little Drummer Boy that his letter will reach you before NORAD begins tracking your every move. I trust Good King Wenceslas — he's always saying, "Children, Go Where I Send Thee." — and so decided to Google you. Amazing what you can learn from the Internet! Who would have thought the North Pole was big enough for all the Angels We Have Heard on High, not to mention Angels From the Realms of Glory, too? All these years I thought you were living at Winter Wonderland, now I find out you hole up with Rudolph the Red-Nosed Reindeer opposite some place called O Tannenbaum in the village of Adeste Fideles. Go figure. Nice cover you got. Does the State Department know about you? Maybe my list — I promise you it's short enough you won't have to be checking it once, then checking it twice — will end up in your spam folder with all the other Holly and the Ivy that's been accumulating since the November elections. No matter. I still believe: Santa Clause Is Coming to Town. I'm ready to Deck the Halls, ring whatever Jingle Bells I have to before the Night of Silence descends and my ISP goes down. I'll even join the March of the Kings if it will make a difference to you, Santa Baby. Do you know I'm planning to go A'Wassailing before I start roasting chestnuts on an open fire? Just thought you'd want to know, because Past Three O'Clock in the morning, our Little Donkey taxi service stops running. If you get into trouble, you're on your own. Those guys are bad news. They'd rather Let It Snow than head out In the Bleak Midwinter to give a lift to some Greensleeves on a Sleigh Ride who's been drinkin' and Rockin' Around the Christmas Tree. Even When Grandma Got Run Over by a Reindeer and my bro' Feliz Navidad got caught up in some unfortunate Christmas Dragnet — he tried his best to explain Baby, It's Cold Outside — they still wouldn't come. Believe me, it was the Bells of St. Mary, a real Blue Christmas, that year. The Man With All the Toys is still laughing. Well, about that list. Like everyone else This Time of Year, I Wonder as I Wander and I have been thinking hard While Shepherds Watched Their Flocks at night. The thing I most want, my one must-have: Silver Bells. Expensive, I know. But I've been good, for goodness sakes! I promise you, unlike Last Christmas, I'll take good care of whatever Little St. Nick brings me but I want Nuttin' Else but those Silver Bells. I'm willing to secret them Away in a Manger with The Friendly Beasts, if I have to. I know Mary's Sweet Little Jesus Boy won't mind. I heard there's plenty of room in that stable. Other than a new silk top hat for Frosty the Snowman, who, by the way, won't be coming Home for the Holidays, All I Want for Christmas is some Pretty Paper to encourage me to write earlier next season. I wouldn't mind if you leave the milk and cookies untouched, either. I'll be needing some energy to stay awake long enough to see who's Kissin' By the Mistletoe. Oh, there is this one other thing. Now that the president's not so occupied with getting re-elected and got plenty of votes to make his own policy, I'd like to ask you to give him one last chance to Go Tell It on the Mountain, declare In dulci jubilo right here on Earth. It's been fun writing to ya, Santa. Suzy Snowflakes says to say hi. Ever since receiving Gabriel's Message virtually, she's been looking forward to The Twelve Days of Christmas. I know she won't be disappointed. Here's hoping you get to Sleep in Heavenly Peace as soon as your run's done. Just remember to Count Your Blessings Instead of Sheep. P.S. It wouldn't hurt one bit to ask your elves to slide into your bulging bag a box or two of newly printed-on-demand copies of Neruda's Memoirs: Poems (T.S. Poetry Press, 2011) and drop them off to poetry lovers everywhere. A writer's got to make a living, you know. How about you? Still waiting to write your letter (or a poem) to Santa? Think you could jazz it up by scattering through your text the titles of or words from popular holiday songs? Share your own missive, or drop a link to it, in the Comments section.